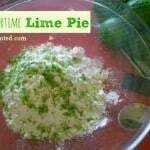 Use the recipe on this page plus zest of 1 or 2 limes, mixed in with the flour.You may need to decrease the amount of water, as the lime zest will add moisture. Prepare and bake the pie shell at 375 for about 10-15 minutes. Put the cornstarch in a saucepan. In a separate bowl, combine the water and egg yolks, then stir gradually into the cornstarch. Bring to a boil over medium heat and maintain for a few minutes, stirring constantly, until it begins to thicken. Remove from heat and stir in the honey, lime juice, and zest. 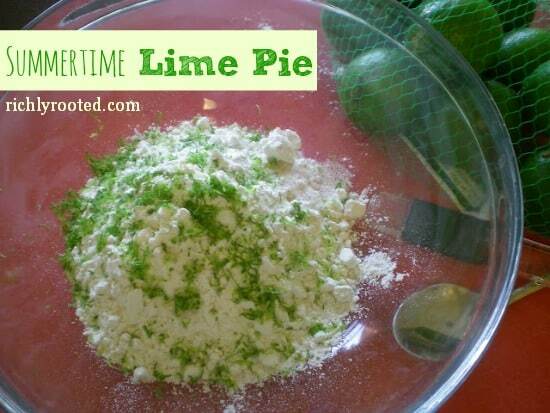 Pour immediately into baked pie shell. Heat the oven to 400. Prepare the meringue by beating the egg whites and cream of tartar until frothy. Beat in sugar, one tablespoon at a time, until the egg whites are stiff and glossy. Heap meringue on top of pie filling; bake pie at 400 degrees for 10 minutes, or until meringue is lightly browned. Cool pie on the counter top or chill in the fridge. Serve. *I used honey for the meringue, and the whites didn't stiffen well. Perhaps there's too much moisture in the honey. I would recommend using white sugar if you want a high meringue.